Let’s say you move to a new town. After a long day of unpacking, your stomach is grumbling so you call up the local pizza place. You ask if you can combine a few extra toppings, and the guy on the other end says yes. Twenty minutes later, you hear that magical knock on the door. You pay, take the warm box into the kitchen, open the lid and…stare at a plain cheese pizza. What happened to all the toppings you ordered? Was the guy even paying attention? In the case of the pizza, you might just shrug it off and decide never to use that pizza place again. Pizza is not life and death, but if you work for a medical device company, an electronics company, or any other company that sells products or parts that people rely on, mistakes can be catastrophic. And yet, vendors make mistakes all the time. I’m sure you’ve worked with vendors who fail to deliver or always seem to confuse the specs. Why does this happen? These vendors obviously don’t have the one golden skill that all great service providers share – the skill of listening to the client. Do you have a vendor who always makes mistakes even though you’ve been working together for years? This vendor probably might not be listening to you. 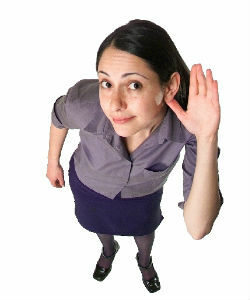 Oh, yes, they may hear the words you say, but are they listening in a deep and perceptive way so they can ask the right questions or raise relevant concerns? You would be surprised at how many vendors sit through a meeting without taking notes or who nod yes to every questions without truly understanding what you want. The result of a well-implemented project starts with a vendor who can listen carefully to your needs, goals, challenges, deadlines, and specifications. If your vendor doesn’t listen carefully from the very beginning, your project may advance like the children’s game of telephone – bad information being mixed up more and more as it goes through each phase of production. Why Are You Still Using Mistake-Prone Vendors? What’s crazy is that many companies will stay with vendors who continue to make mistakes as long as those mistakes are small. (I’ll get to the heart of this issue in my next article). Department heads often feel like the effort to find and train a new vendor just isn’t worth getting rid of a current vendor who is functional but not ideal. What they don’t realize is how much time and frustration a truly spectacular vendor can save. When your vendor listens, you’ll see the difference from the very beginning of the project to the end. Imagine what it would feel like if you could pick up the phone and know your vendor will answer right away and really listen to your question or your concern? What if your vendor was like a partner, just as invested in your product as you? What if parts arrived on time and to specifications every single time? What a huge difference, right! If you don’t know whether your pizza will be right when you open the box, then it’s time to consider working with new vendors. Let me help you. I am a listener-extraordinaire and am here to take all the challenges and difficulties of finding great vendors off of your plate. Give me a call today at (925) 516-2802. I look forward to listening to your story!